Partnership Protection Insurance: Is Your Business Covered? 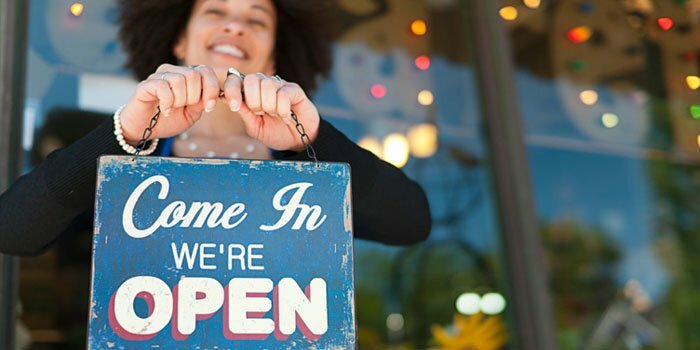 Most business owners won’t operate without some sort of insurance in place. However all too often, business owners purchase the most common policies, without considering the less discussed risks. There are insurance policies today to cover most things, some will be more relevant to your business than others. The key to ensuring you are adequately protected, is to be aware of the most prevalent risks to your business and seek out the insurance policies that will be most effective in covering these risks. 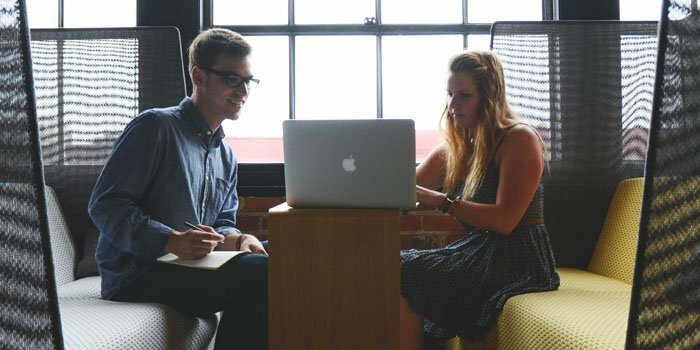 Partnership Protection Insurance is a lesser-known policy in the insurance market, however it can be one of the best policies to protect SME businesses. What is Partnership Protection Insurance? If your business relies on one or more partners to operate, Partnership Protection Insurance can ensure that it continues to run, should the worst happen. Partnership Protection Insurance provides financial protection in the event that one of the business partners suffers a serious illness, becomes permanently disabled or dies. The cover provides the financial means for other partner(s) to buy the share of the business from either the person who has inherited it, in the case of death, or from the original partner if they suffer a serious illness or become disabled. Why is Partnership Protection Insurance So Important? No one likes to think of the possibility of illness, disablement or death affecting themselves, or one of their partners. However, no one knows what is round the corner, and it’s vital to have a plan in place. With Partnership Protection Insurance, you can ensure your business will continue to run should the worst happen, so that you can keep generating income that will assist the families of all partners. Would your business survive if one of the partners in your business became disabled, ill or passed away? Who would inherit each business partner’s shares, if they were to pass away? Would all other partners be comfortable working with this person? Would you be able to afford to pay out a partner’s share if something were to happen to them? Before purchasing any insurance policy, it’s important to consider the role it will play in reducing your business risk. If you have key partners in your business, Partnership Protection Insurance may be relevant for you. The following describes a bit more about the types of Contingency Insurance that may be necessary for your business. Event organisers, promoters and sponsors incur expenses prior to an event for deposits and upfront costs. They cannot afford for an unpredictable event beyond their control to cause the event to be postponed, cancelled or relocated. However, there are a number of situations that can result in this happening, from adverse weather, to physical damage to the venue or issues with access to the venue, non-appearance of artists or speakers, failure of electrical supply, strikes and late arrival of essential items. Pluvius Insurance Cover (names after the Roman god of Rain) is a specific type of cover, where the insured is paid an agreed amount should a specified amount of rainfall at their event. 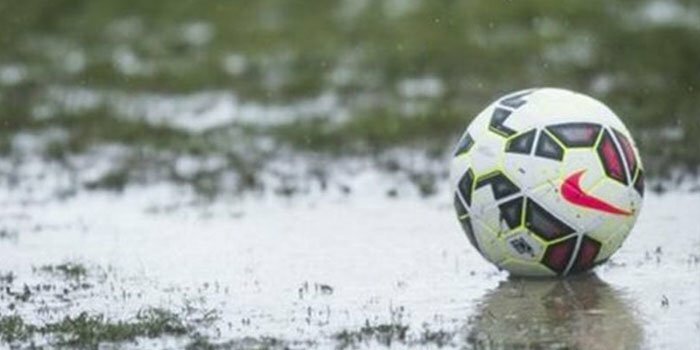 More rain means less spectators and lower ticket sales. For Pluvius Insurance cover to kick in, the event doesn’t necessarily need to be cancelled, however rainfall must exceed tolerance. Prize Indemnity Insurance cover is when the insured is indemnified for the value of a prize in their promotion or competition. Competitions that may be covered include prize Draws and Skill Contests. Prize draws: Competitions drawn at random, such as envelope picks and wheel spins. Skill contests: Competitions that involve a level of skill in order to win, such as a golf hole-in-one or a shot at goal in soccer. It’s important to be aware that specific State Legislation may require licenses according to the value of the prize. Furthermore, for compliance purposes it may be necessary for a 3rd party to supervise the competition. If your business has an important event coming up, Contingency Insurance may be a worthwhile consideration. Speak to us about your options. Most business owners understand the importance of business insurance when it comes to repairing damage or replacing equipment. However, natural disasters and vandalism can not only harm your business, but can make it almost impossible to get back to normal operations – often for an extended period of time. The owners, shareholders, and other financiers of your business expect an ongoing income in order to cover financing costs, business operation costs, and an acceptable level of profit. As such, profit and ongoing expenses including payroll, management and financing costs should be insured. The type of insurance that covers these kind of events is called Business Interruption Insurance. 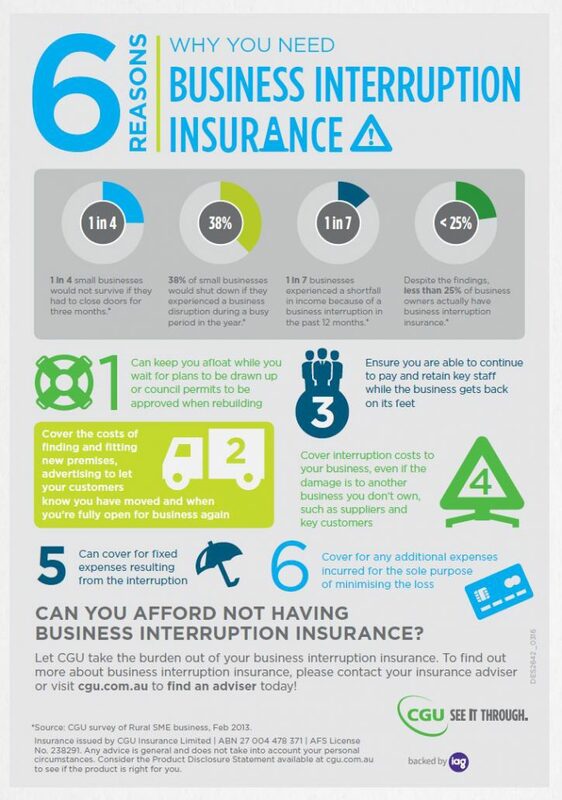 Three out of every four businesses don’t have business interruption insurance. The campaign aimed to educate CGU staff and brokers about Business Interruption Insurance with a series of informational webinars. The webinar series focused on why business owners need Business Interruption Insurance and the most common Business Interruption Incidents. 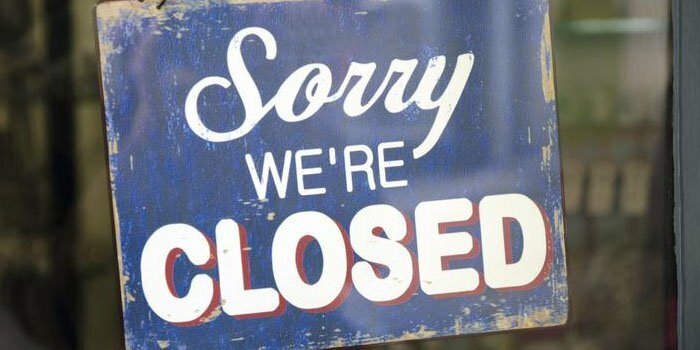 Why Business Owners Need Business Interruption Insurance? Business Interruption insurance is designed to protect the money or income you may lose when your business operations are interrupted and you are unable to operate as normal. This can be as a result of a natural disaster, or even something simple like a power outage. 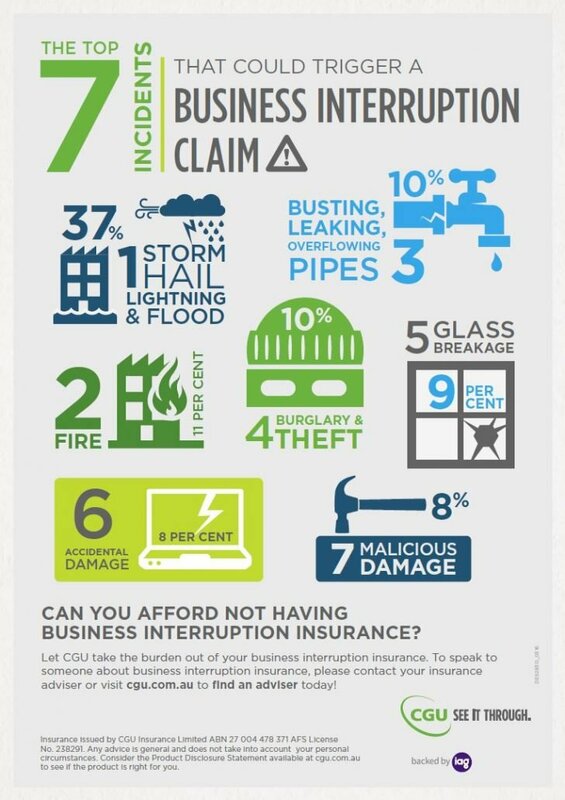 The following Infographic from CGU explains in a bit more detail the benefits of securing a comprehensive Business Interruption Insurance policy. Certain incidents are more likely to result in a Business Interruption claim. CGU outlines the following as the most common incidents to result in a Business Interruption claim. Some of these are out of the business owner’s control, however there are certain events that you can, and should, take steps to prevent. While you can’t control the weather or malicious damage caused by others, there are a number of risk management strategies that your business can employ to reduce the risk of theft, fire, burst pipes and accidental damage. If you have any queries about the above, or would like more information on Business Interruption Insurance feel free to contact us. Hitting Australia’s Eastern Coast at the end of March, Cyclone Debbie ripped roofs from houses, destroyed power lines, knocked trees onto major roads and flooded houses, gardens and roads across Queensland and New South Wales. 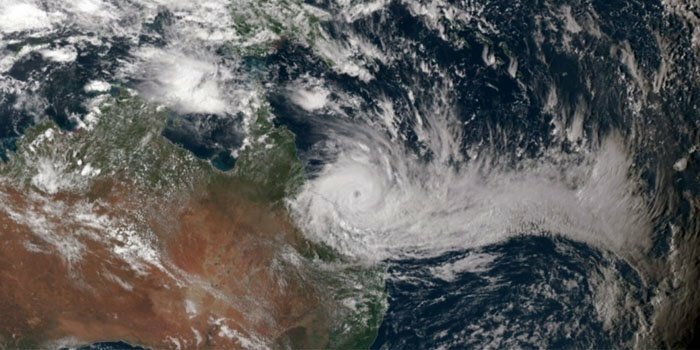 While emergency workers were quick to respond, the cyclone caused severe damage, and was declared a “catastrophe” on the 28th of March by the Insurance Council of Australia. The full extent of the damage is yet to be seen, and thousands of claims are still expected to be lodged with insurance companies in the coming weeks. Less than a week after the catastrophe, the Insurance Council of Australia reported that 19,600 claims had already been lodged, amounting to $224 million. Spokesman for the Insurance Council, Campbell Fuller stated “Claims are flowing in from many, many places – all the way from Bowen and the Proserpine region through to the Gold Coast.” He continued that most of the damage was caused by ‘wind-driven rain’, and that many properties that look relatively untouched from the outside have suffered significant damage to the interior. The clean up operation continues, with many home and business owners left to rebuild, repair or replace their property. Property damage claims, such as replacing broken tiles, smashed windows and ruined carpets, are the most common claims incurred as a result of wild weather. Protecting your business property against the destructive effects caused by the forces of nature is essential. A Property Insurance policy can protect your assets and minimise the financial impact on your business in these circumstances. Property Insurance can cover many property types, as well as valuable business assets such. While Property Insurance may help with costs incurred as a result of severe weather conditions, it’s important to get back on your feet as quickly as possible. As part of the PSC Connect Network, clients have access to Johns Lyng Emergency Response, an organisation that offers urgent property repairs and services to mitigate further damage. The services that they can offer include Emergency Plumbing & Electrical Works, Temporary Fencing, Glass Shuttering and Replacement, Protective Tarping, Demolition and Removal of Debris, Tree Removal, Carpet Restoration, Heater Extraction and Drying, and Emergency Fire Clean. We can recommend the most appropriate cover to fully protect your business and assets. Speak to us for more information on Property Insurance, or our Johns Lyng Emergency Response offering. 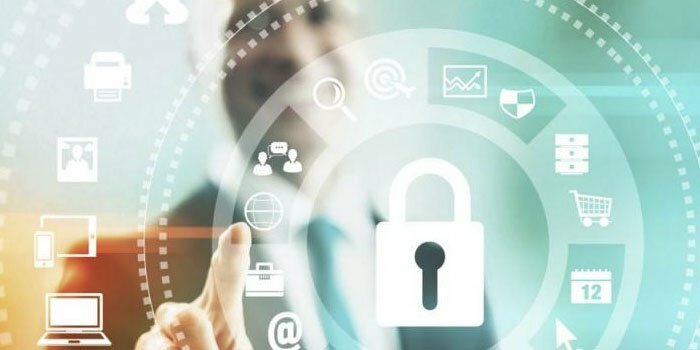 Specialised cyber risk management firm Stroz Friedberg has announced the top cyber threats facing businesses in 2017. Their most recent report “2017 Cybersecurity Predictions,” claims cyber espionage, data integrity attacks, and attacks on Internet of Things (IoT) devices, will be prevalent in 2017. They warn business owners that cyber attacks are likely to intensify in the coming year as cyber criminals become more advanced and more cunning in exploitive techniques. Exploitation of Internet of Things: Cybercriminals will use IoT devices to attack infrastructure. As more people connect more devices to the internet (such as heating/cooling systems and household appliances) cybercriminals have more opportunity to hack these systems. Once they have infiltrated the system, criminals can infect the devices with malicious software, without the knowledge of the owner, and use them as launch points for distributing malware, spam and distributed denial of service (DDoS) attacks. Data Integrity Attacks Will Increase: Data sabotage is likely to become a reality in 2017, where criminals try to create confusion and doubt over the accuracy and reliability of information and data, in order to impair decision-making. More Sophisticated Methods of Spear-Phishing: Spear-phishing is a fraudulent act, where criminals send mass emails from a known or trusted sender in order to encourage targeted individuals to reveal confidential information. In 2017, the way criminals spear-phish will become more advanced and more targeted. The report warned that criminals are likely to increase their focus on using human error as an entry point, and will exploit employee weaknesses to enter the business system, known as ‘social engineering’. The report emphasised the importance of including cyber risk management as a key part of any business’ risk management strategy this year, describing this as “a critical part of doing business” in 2017. Cyber attacks are likely to intensify significantly in the coming year, and it’s important that your business is protected. Speak to your insurance advisor about how Cyber Insurance may be of benefit to your business. A state-wide blackout that crippled South Australia in September last year cost industry in the area over $367 million. 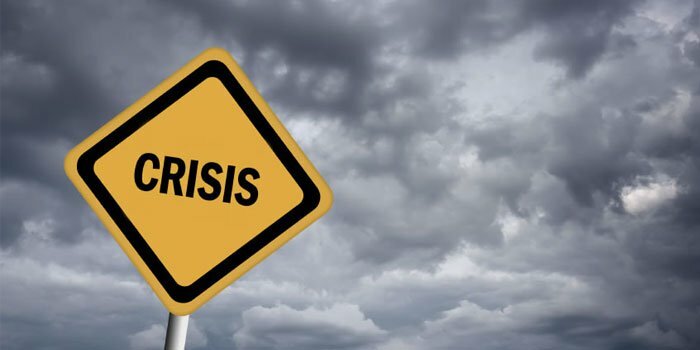 According to a study recently released by Business SA, many of the affected businesses in the area did not have Business Interruption Insurance. Of those that did, more than half were not adequately covered for all of the losses incurred as a result of the unexpected outage. The report estimated that the blackout cost each business affected around $5,000. It is important to note however, that there are downsides to sourcing Life Insurance through your SMSF. 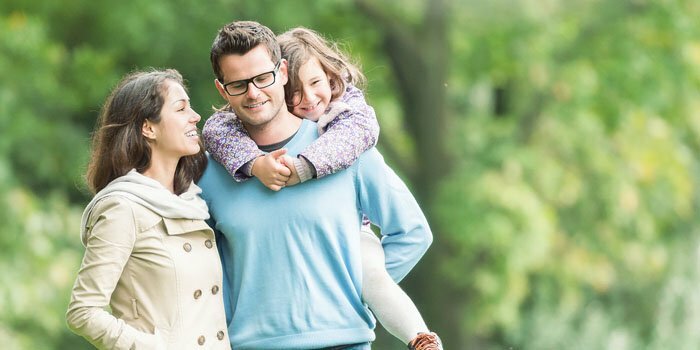 First and foremost, SMSF Life Insurance plans can come with limited levels of coverage and very narrow definitions of what is covered. This means that members can find themselves underinsured. Tax Considerations– Tax is payable on some Life insurance and TPD benefits. If your children are over the age of 18 and intended beneficiaries of an insurance policy, it may be better to hold the policy in your personal name, rather than super to ensure they receive the full payment that they are entitled to. Access to Your Payout– A disability income insurance policy that is held in a SMSF may be entitled to a claim, however it can be difficult to get access to the money, and income payments can be stuck in the super account until you are a lot older or very unwell. Consider keeping disability income insurance policies in your name; the premiums are also tax-deductible to you. Your Type of Work – Total and permanent disability (TPD) insurance provides coverage if you were to become unable to work again due to a serious accident or illness. Depending on your occupation, it can be difficult to be successful in a claim. Many SMSF life insurance options offer “any occupation” coverage for TPD. The drawback here is that with “any occupation” coverage, if you can be employed to do a role, including something other than your specified occupation, you will likely not be successful in a claim. Super Contributions – If you hold insurance in super, it’s important to remember that unless you are topping up your super to offset the premiums being paid for the insurances, you are cutting yourself out of investment returns and reducing your long-term super balance. PSC Connect has a separate Life Insurance division: Connect Life, which is run by Jason Garde. Leading international insurer Zurich has recently released their third annual global SME survey, revealing cybercrime, reputational damage and impact of competition to be the top concerns for today’s business owner. The report surveyed 2,600 C-suite executives and managers in SMEs across 13 countries in Europe, the Americas, and Asia Pacific. It determined that concerns about cybercrime have tripled since 2013, from 4 per cent to 11 per cent, while concerns about reputational damage, have almost doubled, from 8 per cent to 14 per cent. Both of these perceived risks featured on the first survey was in 2013, but have clearly continued to dominate the list of business concerns. With effective risk management strategies and appropriate insurance in place, it is possible to reduce these risks to your business. The fear of being victim of a cyber attack is not unfounded. The Threat Intelligence Brief report [Webroot, 2016] found Australia to be a lucrative market for cybercriminals. The report found Australian-based cyber threats, including malicious IP addresses, suspicious URLs and phishing sites, more than doubled in 2015. Cybercriminals target a range of businesses, often preying on SMEs that hold personal or sensitive information such as customer credit card information or employee bank details etc. As a business owner you must be vigilant. There are certain steps you can take to minimise the risk of being the next victim of a cyber attack, such as defining internal cyber security measures, being extremely careful with sensitive information, and having a data breach response plan in place. A comprehensive insurance policy is also necessary for helping to protect your assets and your business against considerable financial loss. Cyber Insurance can cover the key issues that your business may face in relation to using and protecting data and utilising digital media and communications. As a business owner, you know the importance of your company’s reputation. Businesses with strong reputations attract better people, are perceived as providing more value, and have more loyal customers who are willing to buy broader ranges of products and services. 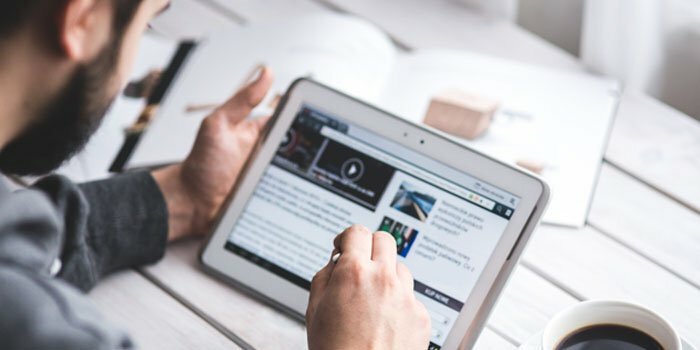 Businesses with stronger reputations tend to be more successful, so protecting that reputation is understandably a huge concern for business owners. There are a huge number of potential incidents that can negatively affect your business’ reputation. Health and safety incidents to product recalls; quality control errors; business and service interruptions; financial losses; ethical violations; allegations over business practice; and facing legal action from a third party are all examples of the risks that can affect businesses. 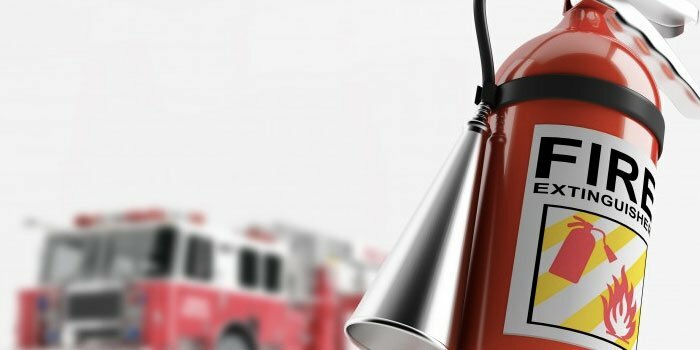 The slightest unintentional error can quickly escalate into a major incident, which damages your reputation, costs you resources and affects your bottom line. In order to reduce the likelihood of this happening, it is vital to effectively manage your business risk. Your insurance broker can offer risk management advice and help to ensure your company is equipped with the necessary resources to mitigate the effects of a reputational risk crisis. Your broker will speak to you about the specific risks that your business is exposed to, and help you put in place a comprehensive insurance plan that addresses all of these risks. By ensuring you have the right insurance in place, you will be able to get your business back up and running again as quickly as possible. Contact me to find out more about effectively protecting your business from cyber and reputational risk. According to a recent report issued by the Financial Ombudsman Service, insurance disputes have rapidly increased in the last financial year; returning to the highs seen in 2011-12 when several natural disasters struck the country. General Insurance Lead Ombudsman John Price said that this increase is a result of a combination of factors including a lack of resourcing on the part of insurers which has lead to an increase in the out-sourcing of complaints handling. Social media also appeared to be raising awareness about complaints processes, which is likely to increase the number people coming forward, he added. Furthermore, the FOS introduced shorter timeframes for resolving disputes and insurers were struggling to meet those deadlines. Sourcing the Right Cover: According to the Financial Ombudsman Service, disputes most often arise as a result of failure to obtain the appropriate insurance coverage. With the advice of an insurance broker, you are more likely to be comprehensively covered. This means that in the event you do have to make a claim, issues are less likely to arise. Dealing with the Claim: After a disaster has impacted your business, your list of things to do is never-ending. Your insurance broker can deal with the claim on your behalf, and communicate with the insurer to ensure it is dealt with as efficiently and effectively as possible. Insurance brokers often have pre-existing relationships with insurers, which means they know how to get the best outcome and resolve any issues that may arise. Reducing Likelihood of Future Claim: Your insurance broker will regularly review your business and your insurance policy to ensure you have the most appropriate cover in place going forward. They will provide a risk assessment of your business to determine any areas where you could minimise risk and reduce your likelihood of a claim. As your insurance broker, we’re here for you and ready to help whether you have a claim or not. Don’t hesitate to get in touch for further information or risk management advice.